The first full day of spring typically marks the beginning of another busy season for many skilled tradesmen who specialize in outdoor work. 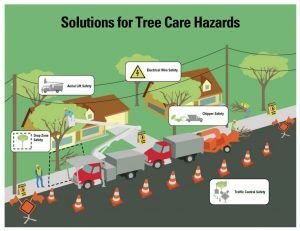 It’s something we don’t often think about as we’re going about our own day, but tree care experts and landscapers are at risk of falls, electrocutions, struck-by and caught-in accidents, and miscellaneous other hazards. Take a moment to think about it, we pass by these tradesmen as we’re entering our place of business and we utilize these tradesmen on our personal property as well. It’s important to be aware of the dangers they face as a result of the type of work they do. This awareness may help minimize the potential risk for accidents, which could ultimately save a life. Safety is key. OSHA publishes several safety-related “QuickTakes” to help both employers and employees identify hazards and other on-the-job safety issues. Many of OSHA’s QuickTakes offer valuable insight for homeowners who occasionally have contractors and skilled tradesmen working on their property as well. You can sign-up to receive OSHA’s QuickTakes by visiting OSHA.gov, but we’ve also included a some of that valuable information below. *All of the resources above are interactive links, so simply click them to view more information about each topic. Always be aware of your surroundings and those doing work around you whether you’re at work or at home. Accidents are avoidable, but it’s a team effort to keep everyone safe. Risk Management & Loss Control is one of the many services we offer at Hillmann. Our services are designed to help our clients prevent work-related injury and illness, and reduce liability exposures in the workplace. Contact us at 1.800.232.4326 to find out more.